Wir freuen uns über die Zusage von elna Deutschland, dass die 830 eXpressive zu 99,9% auf unserem Messestand zu sehen bzw. zu testen sein wird. 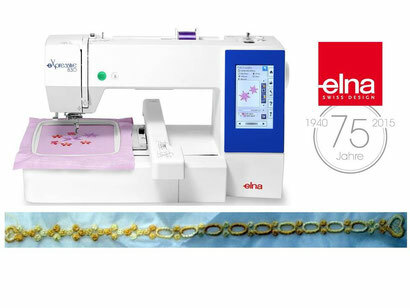 In dieser Maschine sind zum Beispiel Armband-Applikationen und mehr einprogrammiert. Durch die neuartige Stickrahmenführung wird ein ruhigeres, schwingungsarmes Sticken ermöglicht. Greetings from Carolina! I'm bored at work so I decided to browse your site on my iphone during lunch break. I love the info you provide here and can't wait to take a look when I get home. I'm shocked at how quick your blog loaded on my mobile .. I'm not even using WIFI, just 3G .. Anyways, great site! I'm gone to convey my little brother, that he should also pay a quick visit this blog on regular basis to get updated from most up-to-date gossip. I know this web page presents quality dependent articles or reviews and other stuff, is there any other site which offers such information in quality?